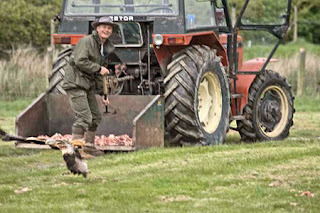 On Monday 1st June 2009, at 8:00pm BBC Springwatch presented by Simon King, will be broadcasting live from Gigrin Farm. 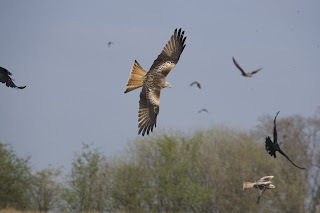 If you watch Springwatch next Monday you'll see an amazing sight as these beautiful birds descend for their lunch. Simon King has his 1,000 frames a second camera in action and this is something not to be missed. I've set my system to record the broadcast as I doubt very much that I'll ever see this kind of footage again. There may be very few kites around as their body clock will have told them that its time to roost. 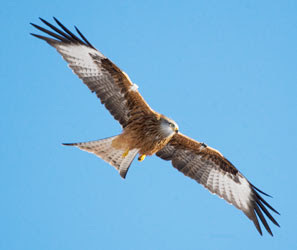 The red kites at Gigrin are again starring on Television. Country Wise were here on Sunday . 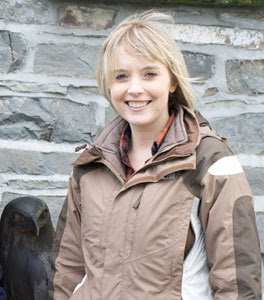 Kate, seen here standing by our red kite sculpture, was the presenter and proved to be happy to try anything. She helped to feed the red kites, although wielding a shovel of meat would likely not have been listed in the job description..
We have around 250 red kites coming for food at present. This is likely to be the level we'll see for the next month as nesting halves the adults that can come for lunch. A tail-less red kite made its entry yesterday but, although it was still incredibly agile despite the loss of its rudder, the meat held in its feet was no longer shielded and kite after kite took after the unfortunate bird until it dropped its hard won meal before being driven out of the area.. This has been a difficult few weeks to bear - waiting for a hard drive to be searched for my photographs and films by a data mining company. Bad luck runs in 3s its said and sure enough, the loss of my backup drive was the third and most distressing of the past months technical calamities. BBC Bristol are waiting, just as I am, for news on a particular piece of film I took earlier this year. I should hear something on the success or otherwise of the retrieval company later this week. I've had some success in rebuilding my photo library as I still have the images sent to magazines etc - the films are a different matter. Easter was exceptionally busy here and led to a field being opened as a secondary car park..
All good news as these busy days help to keep the winter feeding bills in check. We are currently just under £1000/month on meat but in winter that figure is exceeded as kite numbers can be double those we see at present. I'm waiting to receive some printed material from Camerent Ltd - the Camera/Lens hire company. Their rates look extremely competitive and I intend putting their information and rates in both the kite feeding and photographic hides. To hire a lens for a weekend is much better than finding £x,000+ to buy one of the larger lenses.